Although we may not all admit it, through recent years it has become clear to see that mental health plays a huge roll in our Darien Community. Depression, anxiety, and stress are all feelings that are common, especially in high school. It is time to get educated. According to the Parent Resource Program, there are an average of 3,470 suicide attempts in the US per day. In addition, just in grades 9-12, more teenagers and young adults die from suicide than from cancer, heart disease, AIDS, birth defects, stroke, pneumonia, influenza, and chronic lung disease, COMBINED. Worst of all, 76% of youth with depression are left with either insufficient treatment or none at all. And that is why Child Suicide rates are drastically increasing each day. We aren’t recognising what needs to be recognised. 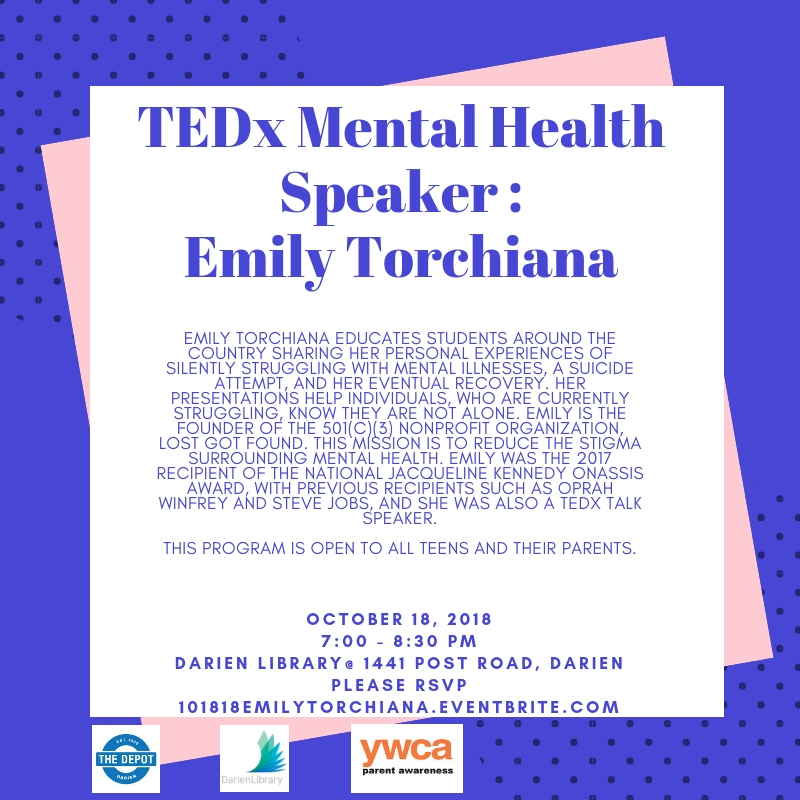 Emily Torchiana, a mental health advocate with a previous suicide attempt will be coming to the Darien Library to share her story with us. Emily is a very inspiring speaker who has travelled across the nation to universities, schools, and Ted Talks. Come to the Darien Library, October 18th at 7 pm to learn her story.